The best salads are simple to make, flavorful and full of fresh in-season ingredients. They are even better if they can compliment any main dish and stand alone on their own. 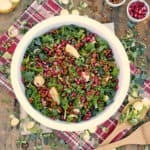 This winter salad is perfect because it is beautiful, full of fresh winter flavors and it comes together easily to make a big bowl of healthy greens that keep you satisfied with each bite. 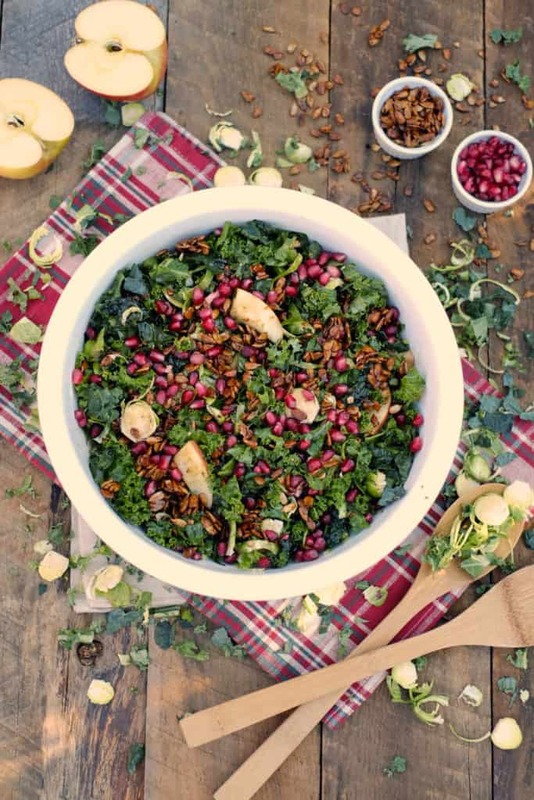 The idea for this salad was inspired by a recipe we found last year for a kale winter salad from the blog A Tasty Love Story. We tried it for the first time around Thanksgiving last year and it immediately became one of our favorites. We loved how fancy it looked and all of the amazing flavor it packed in. For our twist we added a couple of different kinds of kale, some shaved brussels and switched up the almonds for sunflower seeds. The result was a crunchier texture to the salad that was easier to make because the sunflower seeds don’t need to be chopped like the almonds did in the other recipe. We like this salad because it holds up for most of a week in the fridge and we can eat it for lunches during the week. We just make a big batch, toss it with the tangy balsamic dressing and we are all set to eat a healthy salad for lunch! We’d love to hear what you think about this recipe it if you make it. Take a picture and tag us on Instagram @realsimplegood so we can find it! Heat a non-stick pan over medium-high heat and let it get good and hot. Add in the sunflower seeds and dry roast them for 2-3 minutes, until they start to turn golden brown. Add the balsamic and stir it in with the seeds until it evaporates. As soon as it is gone add the honey and stir for 1-2 minutes. Remove the seeds from the heat once they are toasted and starting to turn a darker brown. Leave them in the pan to cool. 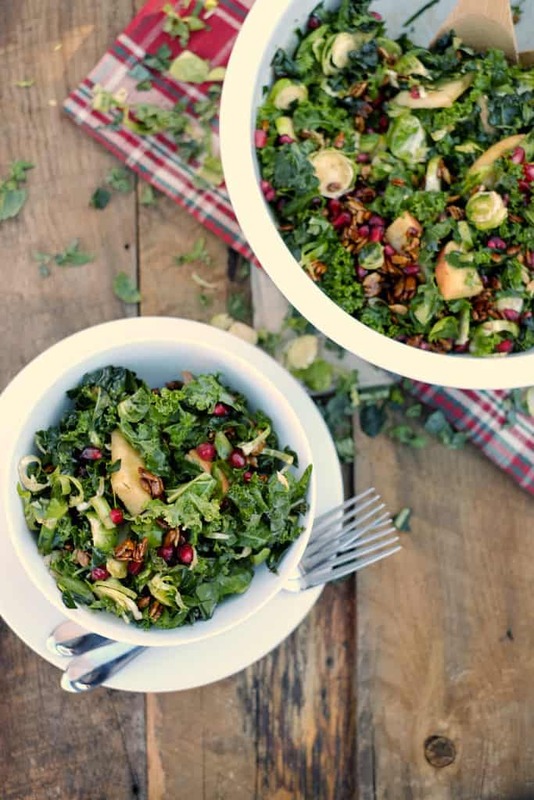 Chop up your kale, brussels and apple. Toss everything in a bowl. Make your dressing by combining all of the dressing ingredients in a small bowl and mixing well. Top with the pomegranate and roasted sunflower seeds. Thanks, Linda! 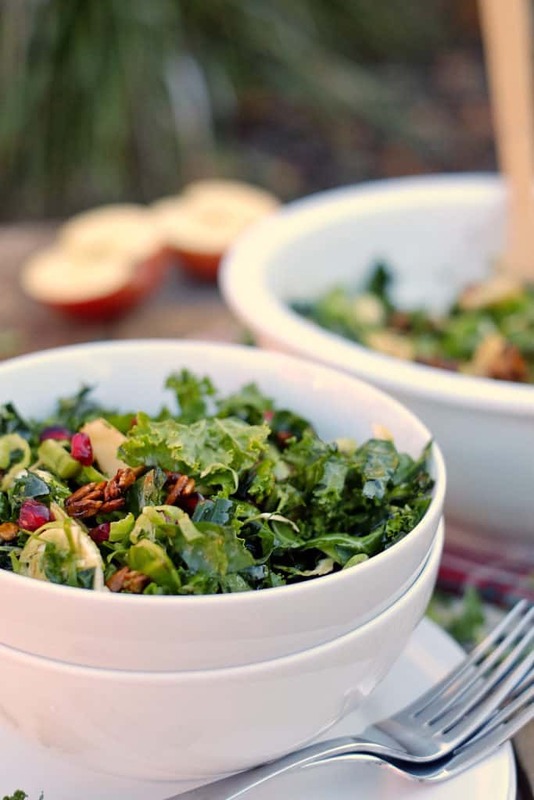 We love this combo as well and hope you’ll find this salad as versatile as we do. Thanks for visiting! Happy holidays! Made this to go along with a pork roast for Christmas dinner–HUGE hit!!! Thanks for your delicious ideas.! Thanks Valerie, so happy to hear the salad was a hit! Happy Holidays!